Update Dec 2011: We’re amazed that so many people ask us for the phone number to the store. Perhaps something for the Pick n Pay store manager to take note of. 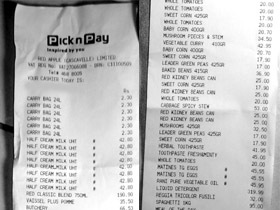 Before you ask us for it, here it is: (+230) 452 9060 (the one on the receipt below is for some reason for the PicknPay Bagatelle store). Some random visitor (hi Jay!) thought that our trip to Winner’s in Bambous the other month was a bit unfair to the competition. Fair enough! We set sail and went on a shopping spree in the much hyped PicknPay supermarket, right after its grand opening last week. Click the image for a fresh receipt of our efforts – the item descriptions should be self explanatory! And the verdict? Well, so far so good! Competition is good for locals and visitors alike, as prices tend to drop overall with more competition. As residents will testify, there has been a supermarket monopoly situation in Flic en Flac for years. The centrally located Spar Supermarket has been dominating the scene, and has practically been the only serious alternative for supermarket grocery shopping in Flic en Flac. Crammed and pricey, it has still been an exceptionally successful business – but perhaps not for very long. The newly opened PicknPay store in Cascavelle is a spacious, brightly lit store, and offers an air conditioned climate as cool as a British summer. The range of products on display is surprisingly wide, and South Africans will welcome their major home country brands, as well as biltong and other South African specialties. At first glance, the prices seem remarkably low, sometimes 30% lower than even the cheaper supermarkets in the area (such as Winner’s in neighbouring Bambous), and compared to the Spar Supermarket, PicknPay is a bargain at the least. Tin products, frozen fish, fresh meat and poultry are all very competitively priced. From frozen halal sausages to fresh Australian beef or South African frikadels. Digging a little deeper into the product structure, one will notice that there is an extensive assortment of fresh specialities, and this is where you will need to get hold of the big wallet. The charcuterie section and the assortment of cheeses are both impressive by Mauritian standards. Between parma and serrano ham to rocquefort and blue stilton cheeses, you will find anything from imported strawberries, cherries and globe grapes, to fresh seafood platters and ready to go meals from the in-store PicknPay takeaway restaurant. It all comes at a price of course. While much of the bulk stock goods have remarkably low prices, the section of fresh imports from Europe and elsewhere requires its wallet. A fair guess is that this is where PicknPay bring the money in. All in all, the PicknPay store in Flic en Flac is a welcoming breath of fresh air in the muggy monopoly that is Flic en Flac (and Black River for that matter) food retail 2011. Three major supermarkets compete for the Black River customers today. The widely popular London Way in La Preneuse, the Spar Pasadena in Flic en Flac, and now PicknPay Supermarket in Cascavelle, at the entrance of Flic on Flac. To add to the excitement, we’ll soon be witnessing the grand opening of the Shoprite Hypermarket, under construction in Tamarin at Le Barachois Commercial Centre – but that’s for another article! Hi Wilna. Where it’s best to settle depend on what is important to you, your budget, and, well – where you want to live! Many South African (and European) expatriates live in or around Tamarin, Black Rock and La Preneuse. For this reason, property prices are very high in these areas compared to Flic en Flac for example. Closer to Port Louis you also have the fast growing village of Albion. This area is very popular with residents working in Port Louis, due to the close proximity of the city (metropolitan Port Louis is less than 20 minutes away). The best advice is to visit Mauritius and stay in several places before you sign a rental agreement. That way you can get a feel for the area and if it is to your liking!